Lucy Harris at centre competing for the ball with Ella Powell-Davies in the background. Right: Captain Maryka Holtzhausen made a winning return from international duty. 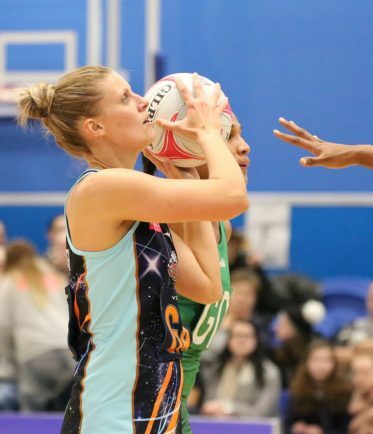 SEVERN Stars skipper Maryka Holtzhausen returned from international duty with South Africa to inspire her club side to a memorable 57-40 victory over Celtic Dragons. 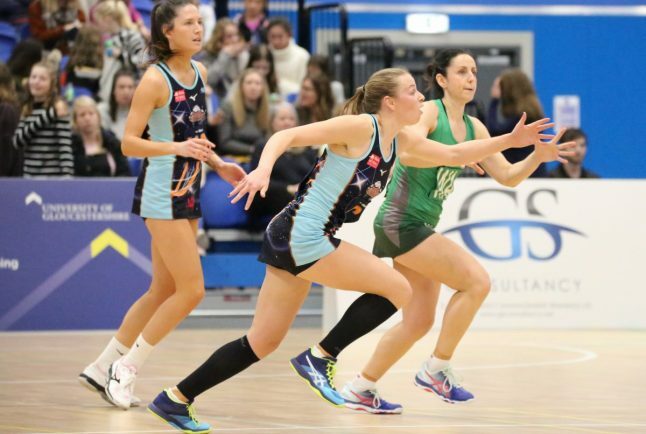 A sell-out crowd at the University of Gloucestershire Arena watched the Stars record their first win of the new Vitality Netball Superleague campaign. “Maryka coming back has given the group a lot of confidence and lifted the level of every player. The Dragons came into the clash on the back of maximum points against London Pulse but it was the Stars who shone brightest from the start. Holtzhausen was back in attack, fresh from starring for South Africa in the International Quad Series. Her experience and game control immediately shone through and her combination with Iona Darroch at wing attack was scintillating at times. 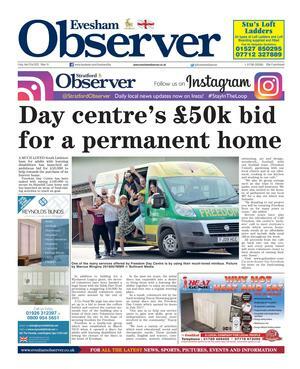 Meanwhile at the defensive end, Jamaica international and player of the match Jodi-Ann Ward turned over ball after ball in the first five minutes, stunting the Dragons attack. Ward formed a formidable partnership at the back with Sam Cook and together they continually rebuffed the Dragons advances in the early stages. The visitors began to grow into the game as the quarter wore on but Stars’ strong start meant they led 11-8 at the end of the first quarter. Welsh shooter Georgia Rowe slotted away goal after goal at the start of the second period, despite the physical attention of the Dragons’ defence. Another player in her first season at Stars, Lucy Harris, began to show just why head coach Bird was keen to sign her. 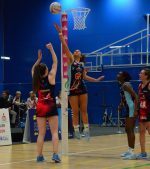 Her constant work rate and defensive commitment at centre made it difficult for Dragons to gain any momentum and Stars went in at the break 28-21 ahead. After the break, Stars looked determined to carry on where they left off and they continued to pile the pressure on the travelling side. Cook, Ward and Ella Powell-Davies, on her first league start, proved tough opponents for the experienced Dragons international attack and although they ticked over their scoreboard, it was hard-work for the Welsh side. Stars extended their lead once again to finish 43-32 at end of quarter. Bird made use of her bench in the final quarter with appearances also for England A internationals Halimat Adio and Paige Reed, as well as a brief cameo for Wales international Cara Lea Moseley against her former club. Stars completed a confidence boosting 57-40 win with a complete four quarter performance, winning every quarter in Gloucester in front of a delighted crowd. 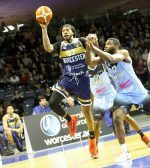 Stars tackle Team Bath on Friday (February 1) before their next home clash against Manchester Thunder at the University of Worcester Arena on February 9.